All aboard for the Summer of Fluff! Meet Hettie Bagshot, a long-haired tabby cat whose whiskers twitch at the first sign of a mystery, and her best friend Tilly Jenkins. Together, they run the No. 2 Feline Detective Agency, and nothing will stop them from untangling each brain-teasing case that comes their way. In scorching temperatures, Hettie Bagshot and her sidekick Tilly set out on a road trip to catch a killer cat amid a sea of entertainers. As Psycho Derek’s bus lurches from one venue to the next, the killer strikes again. The big question for The No. 2 Feline Detective Agency is who will be next? Will it be Patty Sniff, the ageing punk star? Or Kitty O’Shea from the Irish dance troupe? Or perhaps Belisha Beacon’s days are numbered. As the fur flies and the animosity builds, Hettie and Tilly become embroiled in a world of music, mayhem and murder. As matters draw to a terrifying conclusion, will Magical Mystery Paws finally top the bill? This is definitely a book outside of my comfort zone, but this weird, pregnant woman was craving something.. funny? 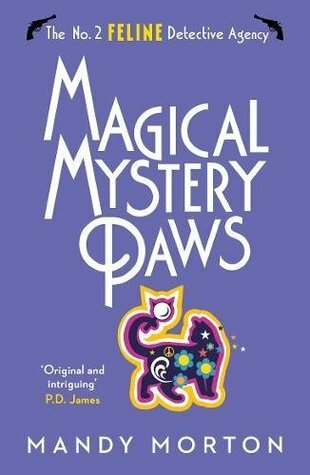 And I stumbled upon Magical Mystery Paws on NetGalley so.. here we are.. The number one thing to know before going into this novel is definitely how the entire cast consists of cats. There’s no human to be seen, at all! Cats all the way, baby! I was definitely curious to see how that would work out since I couldn’t really imagine what this world was going to be like. I really wanted to know what the author had made of it, really. The start of the novel is pretty straight-forward in one way, since you immediately know our two main characters – Hettie and Tilly – investigate murders. This had me eagerly waiting for the murder because.. what exactly would happen in this world of cats?! I really loved the setting of this novel. Hettie and Tilly are helping hands on a band tour and, you all know, I love a musical aspect in a story. It doesn’t always have to be food, right? I could see the author actually knew what she was talking about, so that was a huge plus. Afterwards, I found out Mandy Morton actually has a musical history herself so that explained it, hah. Unfortunately, it wasn’t.. all I thought it would be.. It took ages for the murder to happen. I had read over a quarter of the novel and.. I was quite impatient by then? Is it just me or is that really simply late? I don’t read a lot of murder mysteries so I don’t know but.. I really was losing my patience. That is one of the reasons I had some trouble losing myself in the story. I think the ridiculous amount of character names also has to do with that. There were simply way too many cats with way too many names and backgrounds explained. I kept confusing the lot of them and.. after a while I couldn’t be bothered to go back and figure out who was who.. I did figure out this is probably due to the fact of this book being part of a series.. Wish I had looked that up sooner. I have to admit it was an okay read, but..
maybe I went a bit too far out of my comfort zone with this one? How often to you venture out of your comfort zone? What are some gems you discovered that way? Or some books you’ll NEVER pick up again? Hahaha. It’s like.. the more you discover about this book, the more you tend to go all “meeeh, maybe not” about it. :’) Which is what I went through while reading the thing. I think this book is one that is funny to think about, but just the execution kinda flopped? I was totally excited when I saw it included in one of your weekly wrap-ups, I know that. But your review just showed me — yeah, not actually something I would enjoy. A lot of books … with cats. Huh. I know what to recommend to a cat lover, at least! This sounds like such a strange read. As a cat enthusiast, I am intrigued but am not sure this one is for me. Great review, KAthy!